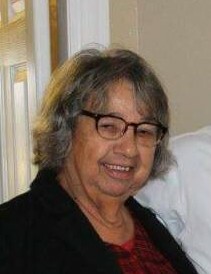 Shelby Jean Hodge, 71, a native and resident of Mount Vernon, Alabama passed away Saturday, March 31, 2018 at Springhill Medical Center. She was a homemaker and attended Grace Point Church. She enjoyed cooking and spending time with her family. She will be dearly missed by all who knew her. Mrs. Hodge was preceded in death by husband, Clyde Mills; daughters, Hope Byrd and Carol Sue Byrd; sons, Troy Byrd and “Lil” Clyde Mills; sister, Louise Taylor; brothers, Rudolph Byrd and Jake Byrd. Those left to cherish her memory is her granddaughter, Savannah Leigh Mills; sister, Cherry Mae Smith (Tom); nieces, nephews, other relatives and friends. The family will receive friends from 11am until the 12pm funeral service on Wednesday, April 4, 2018 at Rivers of Living Waters Church with Rev. Greg Kirkwood and Rev. Eddie Rivers officiating. Burial will follow in Byrd Cemetery. Online condolences may be given at www.freemancitronelle.com. Freeman Funeral Home – Citronelle, Alabama.